How old is the Indus Valley Civilisation? The Uniqueness of Indian Jewelry is associated with its significance and symbolism to many of the deities mentioned in the Vedas, Puranas and the Epics. They are marked as a part of the iconographic description and constant part of the particular deity. They are described with utmost detail of the pattern, occasion and significance in different parts of the above mentioned scriptures. Some such jewelry relating to Vishnu, Krishna, Sita, Draupadi and Shiva find a narration here. significance and beauty to the jewel than the deity. And from there on becomes a part of the identification of the characteristic of that particular deity. The present article takes an interesting look at some such unique jewelry associated with the Gods and Goddess from the Hindu pantheon. For example the imagery of Vishnu is mentioned as carriying a conch, a mace, a wheel and a lotus, but at the same wares jewels like the Kaustubha and a Garland of flowers called Vanamala which are part of his characteristic representation. But at the same time there are narratives in the epic of Mahabharata as to how these jewels evolved and became a unique part of the Lord Vishnu. Many such fascinating episodes relating to the special ornaments of the Gods and Goddesses find an unfolding here. Indian ornaments exhibit a vast variety, with each civilization, Empire, State, region, religion, caste and community following their own unique purpose and patterns of jewelry. The jewels are specially made to adorn parts of the head, nose, ear, hair, neck, chest, waist, hips, limbs, hands, feet, fingers and toes. Jewelry intensifies the experience of love, enhancing its textures, weights, sounds, and movements. Jewelry has no doubt a minimum function but it has a more lasting significant symbolic value. Indian jewelry is a symbol of prosperity and auspiciousness apart from adding to the beauty of the wearer. Men and women adorn jewelry in India with great emphasis to the significance of the marital status and happiness. The Tandya-maha-brahmana describes the house holder who desires to perform the Vratya sacrifice should secure a turban, a whip, a small bow, a rough wagon covered with planks, a garment with black border, two goat skins (one black and one white), and silver ornaments. In the Vedic age, the ornaments of men and women included rings, necklaces, earrings and bangles. The material of these ornaments was gold, silver and precious stones. Some pieces of exquisite jewelry are very famous in Indian mythology. Mention and description of jewels are numerous in Rāmāyana. While describing Ayodhyā, Kamba says there is no city like Ayodhyā and compares it to the jewel Mańgalasūtra or the garland falling over the breasts of Laksmi, which is more glorifying than the other ornament. He further refers to it as the casket of gold in which the kaustubha gem and other ornaments of lord Visnu have been kept. The mandapas were built in gold, the canopies were of jewels and the buildings were made of gold. While describing the people of Ayodhyā he says, all were religious minded and decorated with the ornaments of gold and gems and nothing else. The palace damsels played the ball during the moon light and the jewels fell from their bodies, when the maid-servants swept the jewels their illumination dimmed the luster of the moon light. Describing the jewels of Sītā, Kamba says that the ornaments like the ear-rings, the garlands and other ornaments achieved great beauty by adorning the body of Sītā and she became the ornament of the ornaments. Hence, the mention, description, similes, and personifications of the jewelry are rich in Rāmāyana. The varieties of jewels are embellishments adding to the glamour and richness creating interest in the narration. Amongst these varieties of jewels, the crest jewel cūdāmani worn by Sītā holds uniqueness and importance in the Rāmāyana. In the process of suras and asuras churning of ocean as illustrated in the fig 2 many things came out of the ocean. The sap of plants and herbs was mixed in the ocean water which got converted into milk. Then was produced Vāruni and ghŗta from the milk of the ocean. Then was produced number of jewels (ratnas) came out. The oceans are said to be the mine of many jewels. In the Mahābhārata we find the mention of ratnas or jewels as enumerated from the ocean. They are Soma, Śri, Surā, Turga, Kaustubha mani, Chudamani, Dhanvantari, Pārijāta, Surabhī, Airāvata, Vișa, Apsarā, Jyesthā and Amŗita. Srivatsa – the shrivatsa marked his deep chest, and his pitambara robe shone like gold. The lustrous gem called Kaustubha, a chintamani (gem of thought) meaning whatever its possessor remembers, sees, or envisions is obtained through it, and its touch turns metals and stones to gold. Hari takes it as a brilliant jewel for his chest and the Kaustubha gem is also a symbol of the endless wealth. The significance of jewels like the Shamantakamani is of great importance in the life of Krishna which will be explained in detail in the following discussion. The other texts which show great importance to jewelry are Kālidasa’s ‘Abhijñāna Śākuntala’, in which he weaves the love story of Dushyanta and Shakuntala around loosing and finding of the ring of Dushyanta given to Shakuntala as a token of love; similarly the chudamani is of significance in the Mahabharata where Draupadi discards her jewel chudamani symbolic of her marriage with Pandavas, after the episode of attempt to disrobe her. The cūdāmani of Sītā also marks a turning point in the epic Rāmāyana.. Some of these interesting jewels are discussed here. Cūdā means a sort of protuberance on a sacrificial brick, the single tuft or lock left on the head, the crest of the peacock, a diadem, the summit and a top-room. It also means a meter with 4×7 syllables and an eclipse of the Sun on a Sunday or an eclipse of the moon on a Monday and a particular way of foretelling the future. Cūdāmani also denotes the highest title bestowed on a person to recognize him as meritorious. Cūdāmani refers to the jewel worn by men and women on the top of the head; Lalāta-chūḍāmani- Fixed in the hair forming a top-knot and hanging on the forehead. Among all the jewels cūdāmani is the rare kind and is a symbol of status for married women. It is circular or leaf-shaped, inserted or screwed on the bun of the hair at the back of the head. 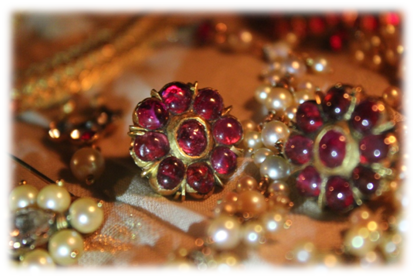 Cudamani private collection about 50 years old, rubies and emeralds set in silver and gold plated. fine example of cūdāmani is found in the times of Krishnaraja Wodeyar III. This head ornament is also meticulously designed. It is dominated by ruby setting, and studded with diamonds and emeralds. The style of workmanship can be traced to the times of Krishnaraja Wodeyar III. The five-inch jewel is set in mandala, the rhythmic lines spreading out from the inner focal point to the outer circle creating a radiating effect. Cūdāmani is a special jewel Indra gets from the bed of the ocean and pleased with the sacrifice gifts it to King Janaka. Janaka as a token of his immense love for his daughter gifts it to Sītā marking the auspicious marriage of her with Rāma. Sītā adorns this jewel with special care as for her; it is a symbol of her marriage with Rāma. She abandons most of her jewels whilst being abducted by Rāvana but retains the cūdāmani with her. She wraps it safely in the end of her saree and used to inspire cheerfulness by the very sight of it, which was for her symbolic of Rāma himself. In her final message to Hanumān, Sītā announces that the jewel is an excellent symbol of identification; after parting from the graceful water-sprung cūdāmani which is like the cornea of her eye, she would be overwhelmed with grief, and may not be able to live for long. Rāma also goes through equally immense emotions on seeing the jewel, brings back to memory all the instances associated with it and he equates the cūdāmani to Sītā herself. Through the epic of Rāmāyana, cūdāmani the crest jewel of Sītā is symbolic of an expression of immense love and belongingness between the lead characters. The poets Vālmīki and Kamba rise cūdāmani to an exaltation of beauty and luster in appearance, symbolic of penance, love, marriage, separation and message of yarning; it is almost personified into a character that has lived, witnessed and reflected each other for the lead characters Rāma and Sītā. The epics have been largely depicted in Indian Art. Relevant examples from the scenes of Rāmāyana depicted in stone in the Rāmachandra temple and Vittala temple of Hampi and a calendar are shown in Fig 5, 6 and 7. Cakrakundala is also known as tatanka or cakrisalaka, probably because of its remembrance of a wheel, an ear-ornament shaped after the lotus in gold kanakakamala is mentioned by Kālidāsa in his Meghadūta. Maṇikuṇḍala is a set with gems in plain tubes of gold called kāñcanakuṇḍala. Drākșakuṇḍala is as cluster of beads worn by seated Kubera the god of furtune. Ratnakundala set with gems mentioned in the Amaruśataka, and describes the young lady of the house, who, terribly tormented by shame, at the utterance of the pet parrot in the presence of elders in the morning, of what it had heard of the newly wedded couple during the night, stops its prattle by putting in its beak her ruby-set ear-ring as if it were a pomegranate fruit. With mention of a few interesting examples of the ear ornaments some unique jewelry are explicated here. He wears divine robes and garlands. He is adorned with divine ornaments. His hands carry a conchshell, a discuss, a mace and the gesture of granting fearlessness. His eyes are like the petals of a lotus. He has the shoulders of a lion, long arms and smiling face. His chest is adorned with the Kaustubha gem and a garland of wild flowers. He has bright bracelets and a crown and also a beautiful ear ornament. His necklaces and anklets are wonderful. His neckband is shining. His ear-ornaments, which resemble a shark in design, look brighter due to their contact with His cheeks. saw Jambavati his daughter playing with the gem. After a long battle between Jambavanta and Krishna, Jambavanta realizes that Krishna was a reincarnation of Rama and apologizes. 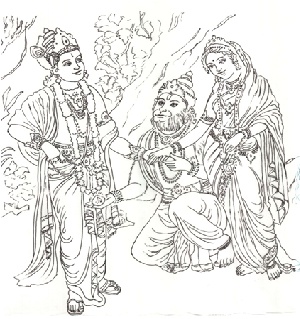 Along with the jewel he offers his daughter in marriage to Krishna. On returning the symantaka mani to Satyajit who refuses to deposit the jewel in the royal treasury but chooses to wear it. After couple of more battles Satyajit is killed and the jewel is handed over to Arjuna’s son Babru, who shone like the sun wearing it. The worn by Perumal with its bright golden shine looks like a Hiranya prakaram (golden fortress) for Mahalakshmi whi is seated on the chest of Perumal. Besides, he is adorned with vyjayanthi vanamala (a garland of unfading flowers). In Nama 216 it has been discussed that the garland He wears is known as Vyjayanti. This garland is also called vanamali, meaning forest flowers. Vaijayanti not only means five tanmatras, but also means the five basic elements. Planet earth was finally created out of these five principal elements – sky, air, fire, water and finally the earth. Earth is grossest of all His creations. Visnu wears a garland called vaijayanti in His chest, which is made up of five gems. These five gems represent the five tanmatras (rudimentary subtle elements sound, touch, ect) because Visnu is wearing the garland vaijayanti. This nama adores Him as Vanamali, as He constantly wears the most celebrated garland Vaijayanti. Garland of wood-flowers. Vaijayanti is also mentioned as a necklace worn by Krishna While the churning of milk ocean is done, finally, Goddess Shri appears visibly as Rama the charming, who is always engrossed in Vishnu. She is offered throne by Indra and rivers, Goddess Earth bring herbs and plants, Ocean offers her yellow silk, Varuna gives her the flower garland signifying victory called Vaijayanti, the prajapati named Vishvakarma gives her ornaments, the Goddess Sarasvati gives her a pearl necklace, and lotus-born Brahma and Nagas give her earrings. She places the vaijayanti and garlands Vishnu, hence he comes to be called as Srivatsa, and gives her in return his own chest as a place to reside, where she lives as the emblem called Srivatsa to bring prosperity to all her subjects. The Vaijayanthi necklace of Lord Vishnu is crucial to the revelation of Vaikuntha. Considering Vaijayanthi as a living entity, and assuming relation through feminine genotype, she is the representation of absolute super controllership in context of civilization. Her mood transcends the need to magistrate, for she fascinates the applicant civilian from his or her relatively distracting wizardry or witchcraft into a more peaceful co-operativity by reflecting glory through strength absolute. In the plastic art it is found on the figures of Visnu. Gopinath Rao explains the vaijayanti as a “necklace composed of successive series of groups of gems, each group wherein has five gems in peculiar order. The Visnupurana describes it as “five-formed as it consists of the five gems associated with five elements and it is therefore called the elemental necklace. became such an invariable item of Vishnu, that no image of Vishnu, and sometimes even the Ayudhapurasha and avatāras could be seen without it. The vanamala is normally shown as a thick garland reaching upto the knees, but variations occur in its patterns and designs. Various motifs are used in the depiction of the vaijayanti in different periods and in different regions. 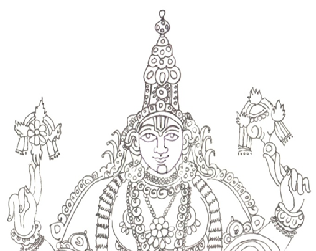 The vanamala of Narasimha is composed of a series of lotus pairs, held by double strings. 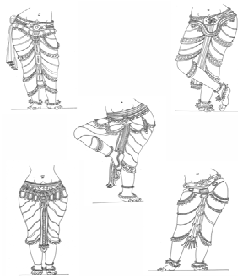 However, the most romantic of the female ornaments is Mekhala, also known as Kanchi and Rashana, which is worn round the waist, below the navel, covering the jaghana region. It is constituted of a single or many strings of beads playfully jingling on the hips as illustrated in Fig 10. In Kalidasa’s poetry we find frequently lovely women with fully rounded hips wearing Mekhala. In the third act of Kalidasa’s romantic comedy, the Malavikagnimitra, we see angry and fully drunk queen Iravati, suspecting the fidelity of the king Agnimitra trying to beat him with her Mekhala. In his Meghaduta he has likened the birds flying over the river Nirvindhya to the Mekhala. He also speaks of jingling of the bells attached to Mekhalas of girls dancing gracefully in the temple of Mahakala in Ujjaini at the time of his Sandhya arati. The Saundarānadakāvya of Asvagosha refers to the anklet nupura at several places. The whole tragic story Silappadigāram, of the Sangam literature centres around an anklet. Kalidāsa, Sūdraka, Rana and others refer copiously to the anklets (nūpuras) in their works. Nakșatramālā is a necklace of twenty seven pearls, Arthaśāstra, explains naksatramala, as a necklace of twenty seven strings. Also called as jyotișkā, Prālamba and mālā, long garlands of flowers. Among these vanamala and vaijayantika was a big garland. Many types of amulets are mentioned in the Vedas, like Mekhala is a girdle made of munja grass. It is used in the rite of sorcery as a waist-band. The god (deva) bound this girdle for carrying the rite successful end. It is a weapon of the sages. It partook of the first bow. Mekhala is the daughter of Faith, born of penance. She is the sister of seers who produced all beings. The girdle is invoked to grant thought, wisdom, penance, Indra’s power and long life. Mekhala – belts – The waist ornaments like the mekhalas (belts), kati–sutras (lion-cords or waist belts) srnkhala (chains). The kanchi with a net of pearls, the talaka, the mekhalam, the rasana, and the kalapa are the ornaments of the hip. The kanci is of one string, mekhala of eight, rasana of sixteen and the kalapa of twenty-five strings. In case of goddesses and queens, there should be a combination of thirty-two, sixty-four of one hundred and eight strings. Mekhalas consists of a series of chains or strings some horizontal, some hanging freely downward as tassels, and others arranged in small or large loops. Yakshi Chamaradharani of Didargaj and Yakshis at the gateways of Sanchi Stupa are best illustrations of this type. The reliefs represent two varieties of beaded belts namely, the beaded-belt with a clasp in the centre and the one of plain variety. The former composed of a number of strands of beads with a clasp provided in the centre. It adorned the waists of the amorous ladies or ladies of dohada. The number beads that constitute the mekhala ranges from one to four or more. As for their material it might be said that, it was gold, silver, or some other metal and fashioned in the same way as their necklaces and wristlets. We find an excellent example of mekhala, with a circular clasp in the centre, on the waist of two ladies performing dohoda in the panel depicting the Mandhatu Jataka. Their belts decorated with a row of beads or gems and have a circular clasp in the centre: the ends of the clasp are interlocking. Their mekhalas are tied roung the waist independently. Parallel examples of this can be had in the paintings of Ajanta. The painting depicting ‘the toilet scene’ there reveals a female attendant wearing a mekhala of this type. Mekhalā with several rows of small beads which possibly represent mekhalākalāpa mentioned in Sanskrit literature. The ornaments of the waist are very common both in early Indian art and literature. 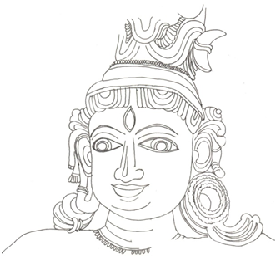 The Suṇga, Sāhtavāhana and Kushan schools of art depict them copiously. In literature they are variously known-as the rasanā sārasanā, mekhalā, kāñchi, saptakī and were fashioned in the same way as necklaces and wristlets (Arthaśāstra). The mekhala and mani–mekhala is composed of innumerable strands of gems and is often called mekhalākalāpa. Hala in the Gāthāsaptaśatī speaks of the dark beads in connection with the composition of the jeweled mekhala. Perhaps Hala had sapphires in his mind. A whole epic in Tamil literature is based on the anklet – Silappadigāram, and on the girdle of gem-maṇi mehakalai. The Natyasastra of Bharata, while enumerating the waist-ornaments, refers to the kanchi (a girdle of one string), the mekhala (of eight), the rasana (of sixteen), and the kalapa (of twenty-five strings). Later, Kālidāsa, Śudraka, Bāṇa, Māgha and others speak of girdles at several places in different contexts. Again Amara mentions of the Srnkala (a chain) as a waist garment. The big garland peculiar to deities of terrific form illustrated in the was a collar composed of bones and skulls. This kind of garland called the ‘Rundamala’ adorned by Shiva the destructor and Kali. 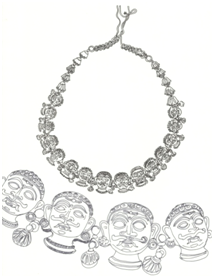 According to Amarakosa, long collars were made of gold or other precious metals and they were known as Hemasutra. Originally actual threads were worn, but later threads of precious metals have replaced the actual threads. This type of Kanakasutra might have been one of the earliest prototype of the now Mangalasutra, one of the most important symbolic ornaments of women in the South, Deccan and Maharastra. History of ornaments is as old as human civilization and Indian Art and Architecture are replete with ornaments depicting every civilization, empire, reign, region, caste and community following their own unique purpose. The patterns and creative styles were of these ornaments were a veritable cornucopia of craftsmanship of the people in those times. In literature too, jewelry emphasizes gestures of love and its contours equally. Jewelry, no doubt has a minimal functional quality but is rich in providing a more lasting, significant and symbolic value. Indian jewelry is a symbol of prosperity and auspicious, apart from adding to the beauty of the wearer. Men and women both adorn jewelry in India with great emphasis laid on the significance of the marital status, happiness and prosperity as well. Indian jewelry explicitly refers being adorned on different parts of the body of the Gods and Goddesses. The jewel is only a piece of gold and silver metal decorated with precious gems and pearls but acquires sacredness after it is bejeweled by the Gods. They also get characteristic nomenclature specially identified with that God. The following hymn from the Dwaadasha tarangam is a wonderful expression of Sri Narayana Teertha which describes the Supreme Being as adorned with divine diamond –studded ornaments. Let us all follow the Supreme Being ……….